Ashbury Precision Ordnance APO Riflecraft (APORC) Precision Rifle/Sniper Training: Advancing America’s Proud Outdoor Heritage of Rifle Marksmanship | DefenseReview.com (DR): An online tactical technology and military defense technology magazine with particular focus on the latest and greatest tactical firearms news (tactical gun news), tactical gear news and tactical shooting news. Ruckersville, VA. – Ashbury Precision Ordnance (APO), manufacturer of the patented SABER® modular rifle chassis system, premium grade precision rifles, and long range shooting accessories is expanding its line of client services with the introduction of Riflecraft. This new client service offers an innovative series of core rifle marksmanship programs conducted in the picturesque forested mountains of Central Virginia by a company dedicated to providing exceptional Riflesports experiences. Ashbury’s lineup of full training programs, advanced skills workshops and field shooting clinics are designed to attract new outdoor-oriented millennials, active rifle shooters and hunting enthusiasts. Ashbury’s Riflecraft programs grew out of the “country comfortable” APO Experience, an experiential shooting sports initiative for adventurous travelers and corporate retreats. The APO Experience offers customized “bucket list” Riflesports experiences, complemented with end-of-the-day artisan and chef inspired forest-to-fork cuisine, cordials and engaging fireside conversations with experienced firearms professionals. For over two decades, Ashbury has developed an exceptional network of passionate long-gun professionals from many sectors of the firearms community. These specialists include skilled competitive shooters from various rifle disciplines, gunsmiths and precision rifle builders, professional hunters of North American and African dangerous game, experienced small arms & firearms trainers and veteran US military Snipers. Each professional provides distinctive direction, support and assistance to Ashbury in its development and delivery of innovative Riflecraft training. Adam Wilson is an APO Shooting Team member and veteran US Army Sniper with multiple combat deployments, a marksmanship instructor in the Texas Army National Guard and firearms training blogger at 1 MOA Solutions. He is a passionate advocate for civilian marksmanship training with a proven instructor background helping shooters reach their true potential. Adam joined the Ashbury team to focus on growing Riflecraft programs by cultivating new recreational shooters, promoting long range precision shooting, and improving the marksmanship skills of predator and big game hunters. Riflecraft’s unique blend of technically oriented precision rifle courses, provide clients plenty of high quality trigger time based on well established marksmanship fundamentals and challenging terrain. Riflecraft’s progressive building block approach to rifle marksmanship training welcomes inquisitive gun-curious adults, women seeking outdoor sports options, as well as concerned parents seeking age and demeanor appropriate firearms safety training for teenagers. All APO Riflecraft programs are fully supported with some of the industry’s best hand crafted precision rifles and a full complement of quality long range shooting accessory equipment. Clients gain hands-on experience with premium brands like Leupold, Talley, Ruag, Hornady and more. The Riflecraft facility utilizes a wide array of well maintained reactive steel targets, movers and custom AR500 Game Steel targets (e.g. Prairie Dogs, Coyotes, Wild Boar, and big game) custom designed by sponsor Best Targets. At Riflecraft, we make the expression “when pigs fly” a reality, because only at Riflecraft can you can “ring steel” on our very own challenging Flying Pig target! Riflecraft participants are encouraged to bring their favorite rifle of any brand or type to Riflecraft training courses where they can develop the skills and confidence necessary to engage targets outwards of 2,000 yards in real world field conditions. Riflecraft programs focus on safety, building fundamental rifle marksmanship skills, establishing consistency and improving proficiency at all ranges. For those new to the Riflesports, Ashbury offers rental equipment and features an all-inclusive tuition package. This package includes a selected APO precision rifle (.223 to 50BMG), premium optic, ammunition and all accessories clients need to participate in small group or customized private training. Participants only need to show up in range-appropriate apparel and let the Riflecraft Training Coordination Team handle the rest. For more information on Riflecraft programs please visit APORiflecraft.com and if you have an interest in Ashbury’s experiential Riflesports offerings, visit APOExperience.com. You can also view APO’s complete line of modular rifle chassis systems, precision rifles, custom pistols and long range shooting equipment at the Ashbury Web Portal AshburyIntlGroup.com. Ashbury International Group Inc. is a central Virginia USA based company, having more than 20 years of international experience as a prime contractor to government agencies, military, and special operations forces as well as manufacturer of commercial shooting sports equipment. The company provides logistics, engineering, training, ordnance manufacturing, and systems integration. Ashbury Precision Ordnance Mfg. (APO), a division of the Ashbury International Group Inc., is a BATFE licensed 07/11/SOT commercial firearms and shooting accessories manufacturer. APO manufactures SABER bolt action receivers and patented modular rifle chassis systems for factory and custom bolt action rifles. 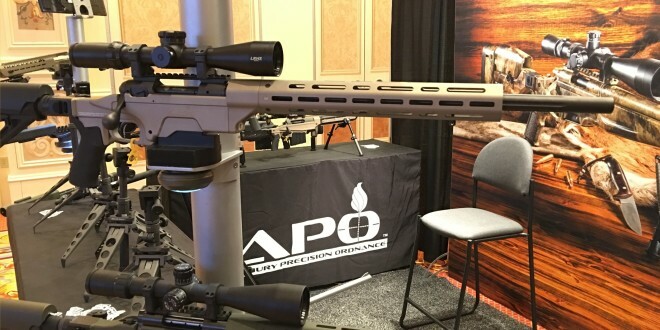 APO manufactures custom precision tactical and multi-sport precision rifles in calibers from .223 to .408CT. The APO Custom Shop offers custom reflex sight installation on pistols and complete special order custom rifle and pistol builds for discriminating clients. APO manufactures high quality rugged electro-optical weapon mounts and TACT3 tactical field tripods. The company also distributes a wide range of rifle sports accessories to include Ruag Swiss-P ammunition, Field Firing Solutions (FFS) ballistic software, the RSTA-II Tripod Shooting System, Long Range Accuracy Bipods, and Snipers Field Tool Kits.